Next time you are looking for a new wheel balancer, dig a little deeper than just the price and brochure. Most manufacturers today, even if they claim their machines are made in Europe, will be using low cost, inferior quality hardware made in China. The threaded shaft, locking handle and cones can represent a large chunk of the price of a balancer, so there is a significant saving to be had by reducing the quality. At Hofmann Megaplan, we continue to to use hardware from leading German manufacturer Haweka as OEM fitment to our machines, thus guaranteeing the longevity and repeatability anyone who has used Haweka will have become accustomed to. Approved by all vehicle manufacturers and tyre manufacturers, the Haweka product is precision engineered in Germany by people who know the importance of mounting the rim correctly when wheel balancing. This philosiphy even stretches to something as basic as balance weight pliers; we've noticed recently how many suppliers are providing pliers with their machines that fall apart within a matter of weeks, sometimes days. 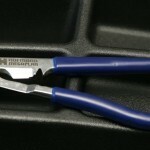 Again, at Hofmann Megaplan we still supply our own pliers, of the highest quality, that reflect the quality of components used throughought our range.